« Is Telemedicine on Track to Fulfill Its Potential? All around the world, remote healthcare services and technology are rapidly growing are becoming highly popular for healthcare organizations. The adoption of the telemedicine services varies in different countries. Although, the U.S. is one of the slowest to understand the extensive and the positive aspects these systems could deliver. Number of studies have already been carried out in looking into tele-monitoring, many of these studies showing how beneficial remote healthcare can be. Findings have actually featured reduction of readmissions in hospitals by 83%, reducing visits by 66% in home nursing, as well as bringing down the overall costs by over 30%. Additionally, patients and health professionals making use of telehealth technologies have noted greater satisfaction with the treatments. These studies have already been sufficient to encourage various nations, including the United Kingdom, to include remote healthcare in their existing healthcare practices. Even now, the body of evidence encouraging remote medicine as well as its outcomes keeps on growing. Hard data consistently mounting in support of remote healthcare. The huge cost savings can’t be overlooked and hardly anything else has proved better to minimize these costs. The advanced communication between physician and patient it facilitates will eventually make the remote medical services and the telemedicine technologies an important part of many healthcare organizations. Nowadays mobile phones along with tablets are being used for almost every single thing, from keeping track of your bank account to booking a cab, therefore it would only be sensible when health care be associated with this technological growth as well. 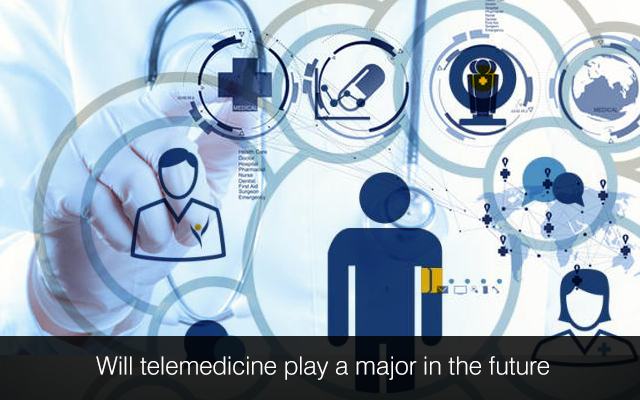 Many people think that the telemedicine will be the future of health care in the U.S. Recently, in a trade show at Los Angeles by the American Telemedicine Association (ATA), a telemedicine provider, American Well, announced ‘Telehealth 2.0’, an extensive set of telemedicine services and products. Included in this are live video visits over the phone and on the web, immediate patient data, also the potential for physicians to check and accept or decline visits to their smartphones. Roy Schoenberg, CEO at American Well, mentioned that telemedicine is just the beginning and they’re going to take telehealth which was used as a ease measure for the patients and place it in the hands of doctors. The rise in popularity of telemedicine is due to the convenience. The new app from American Well for doctors includes integrations with Apple’s biometrics allowing patients health records on the touch of a finger. There is another app from American Well that connects patients with physicians in just 2 minutes. As indicated by Forbes, American Well, physicians eventually conveniently shifting in between their virtual and the physical waiting room patients, a system that will let them see more patients than before. Enabling physicians to handle minor health issues, for example cold and flu in a virtual system could ideally make more space in the real waiting rooms for even more seriously sick patients. Schoenberg mentioned that other than the flu and cold, telemedicine has the capacity to deal with more complex situations, for instance cancer and heart ailments. Already, American Well has been working with major hospital systems such as Cleveland Clinic and with Massachusetts General are now using American Well technology for treatment of patients. These two organizations have begun to realize that the type of care they could extend will significantly be different if they see you in the home all the time, while you are going through an ongoing treatment, Schoenberg stated. Schoenberg also mentioned that we might soon see a time when services such as American Well can link you not only to some old doctor, but will connect you to your own doctor. UnitedHealthcare has established collaboration with 3 telemedicine organizations in order to address video-based physician visits as it covers in-person visits. The technology has for many years expected that we will someday get our medical care through video chat, however it was not till in recent times that forward thinking doctors began taking potential of telemedicine seriously. The move from so influential a player within the healthcare industry to the telemedicine certainly is a strong indication however the technology is getting into the mainstream. An American magazine Wired, published in print as well as online editions stated that UnitedHealthcare, WellPoint, Oscar and the several BlueCross BlueSheild plans have implemented telemedicine programs in recent times. According to Schoenberg around the clock care might take some time to get on, however the United collaboration may help and push those ideas forward. This Post was posted in Health Care and tagged Develop Electronic Health Records, healthcare software development, Healthcare software development services, healthcare software integration, healthcare software maintenance, hire healthcare software developers, Medical Software development. Bookmark the permalink.